When it comes to jailbreaking iOS 11 we had no other options except using Electra jailbreak tool . But as of this week many things have changed. Earlier today Electra team member Pwn20wnd announced the release of a semi-untethered jailbreak tool called UnC0ver. Calling it “the most advanced jailbreak tool.” Moreover, enc0ver is cited as being a joint effort between Pwn20wnd and hacker Sam Bingner, with the UI having been designed by Dennis Bednarz and Samg_is_a_Ninja. Right out of the box, unc0ver supports iOS 11.0-11.4 beta 3, which means it supports more firmware versions than Electra. But what really sets it apart is the distinctive jailbreak app, shown above, which incorporates a bevy of handy jailbreak-centric features. 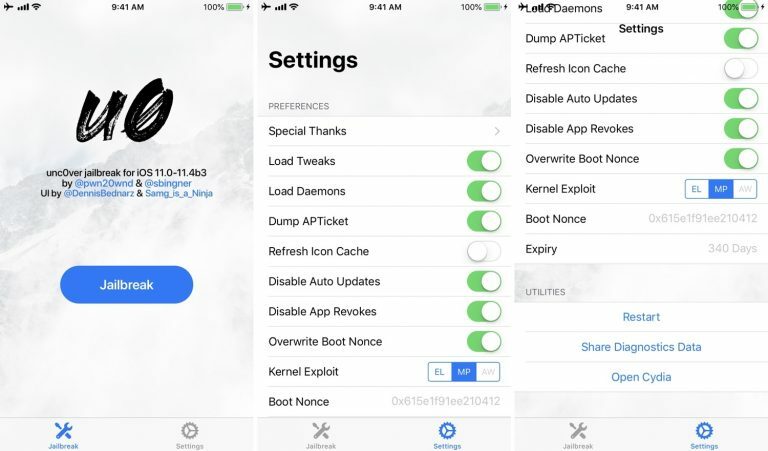 Like most semi-untethered jailbreak tools, unc0ver is installed on a by way of Cydia Impactor. This means that you’ll need to download the app’s .ipa file from Pwn20wnd’s GitHub page and side-load it on your device to run it. Once side-loaded, you can follow the on-screen instructions to proceed with the jailbreak. As usual we will be covering a full guide for this new tool and how to use it to jailbreak your iOS device.